A pretty interesting movie about what happens when the students take over and run a military school by force. 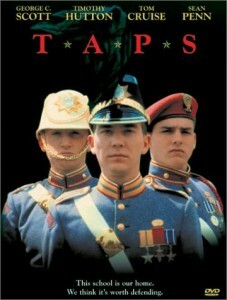 This movie tells an interesting story of a military school where the students have taken over. It takes a while to get going, and certainly builds in momentum as it goes on. Tom Cruise is the stand out here, not because he’s the most famous actor of the bunch, but because his character is the most lively and visceral. He’s the wild card in the group, and while his part isn’t huge, it’s certainly the most memorable. 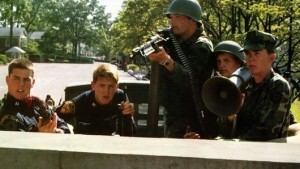 TAPS is a military movie where the inmates run the asylum, so to speak. It’s Lord of the Flies with kids running the show all the way. 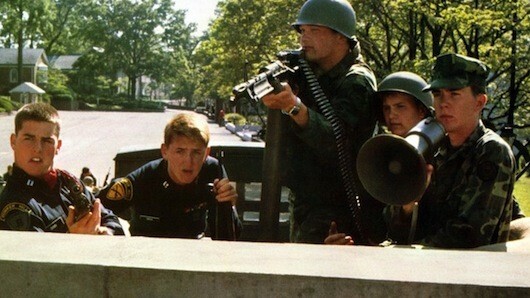 By kids, of course, I mean young men in military academy, who make armed threats and go way too far for a cause. 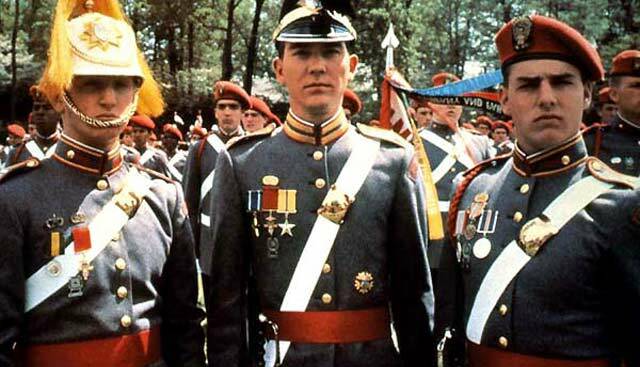 There is only one adult with them, at the army training school, and thats really only at the start of the film. This one adult is General Bache, and who better to play him then General Patton himself, actor George C Scott? He’s the high authority that all of the kids look up to, and his fate becomes the trigger point that sets these kids off on their mission. You see, General Bache isn’t with the kids at the school for very long. He’s just there to kind of kick things off. What we do have on out cast list, the whole way through, however, is three very promising up and coming actors from that time, who have since gone on to have some great careers in the movies. This film features a very young and new-to-the-movies trio of Timothy Hutton, Sean Penn, and Tom Cruise. While all three actors are great here, there’s no question that Cruise is the standout, playing the character who is the most determined and unyielding in his stance on the cause. He’s the character who is the scariest and most ferocious. By the movies end, he is also by far the most compelling. The movie starts out with us watching these three students in their daily lives of training at the school. There is some competition and some tension and banter, particularly between Cadet Captain Dwyer (Penn,) and Cadet Captain Shawn (Cruise.) Hutton, however, is the star. He’s front and center, as Major Moreland, the leader of the bunch and the most mature and responsible of the group. Moreland is the one who gets along with everyone and is the peace maker among all who attend the school. He’s the everyman, rational character who we are meant to relate to most, whereas some of the others are the eccentrics. After the brief introductions, we see that Moreland is being awarded the honor and rank of major by General Bache. He meets with Bache in the General’s private quarters and they toast to honor. But then, the very next day, the General gives an end of the year commencement speech in which he declares that the school will be closing the following year. That means it has one final year to remain opened, and that’s it. The property has been bought out by other contractors, and the government has agreed to shut the place down. This news comes as a surprise to all of the students. Considering that they were just toasting to honor, Moreland is shocked that Bache made no mention of this to him, when in private quarters, in the previous scene. But Bache kept the news close to his chest, and Moreland most definitely feels betrayed. And then things get worse. Not knowing what to do, but knowing that there was no way they can stand idly by, tension builds up, and the kids get into a fight with locals. That’s when Bache shows up and tries to stop the whole thing. In an action that makes little sense, other than that it sets the rest of the plot into action, Bache pulls a gun and accidentally shoots one of the kids. The consequences are pretty dire. General Bache is taken into custody. The authorities decide that waiting a year is too long, and the school should now be shut down immediately. This prompts the kids to see this as a now or never opportunity, and they grab guns and close the gates, licking themselves in. Moreland is in charge. The kids have taken over. When authorities come to the gates, the kids make demands. They want the school to stay opened. They want the general released. And they want the authorities to leave them alone. Basically they want everything to go back to how it was. It’s a very childish and unrealistic way of looking at things, but after all, these are kids. And they have guns that they feel very comfortable using. They think just having these guns and making these threats will be enough to get then what they want. The movie is mostly about the period of time when the kids hold the school. Moreland takes multiple meetings with people who are trying to get them out, including his father, who was a military man himself, and never understood feelings or sensitivity. There’s a great story about how when Morelands mother died, his father left him in a church for a set amount of time to grieve, and after that time was up, the grieving had to be done. With this younger kids at the school, the issue arises of whether these kids are staying there due to peer pressure, or whether they really want to be there. Some of the parents start driving around in vans, using mega phones to reach out to their kids. And there are a couple of instances of kids making a break for it, to run out of the school. One of these instances is more memorable than the others. Among the higher ups at the school, (Hutton, Cruise, and Penn,) there’s a lot of turning on each other and a sever lack of trust. This movie really captures their stressed mentality and nicely leads to a climax that is both realistic and brutal. The ending is far and away the most powerful part of the film. In fact, this is really a movie that gets better as it goes on, and the stakes continue to get raised. It’s a surprisingly interesting and powerful film.